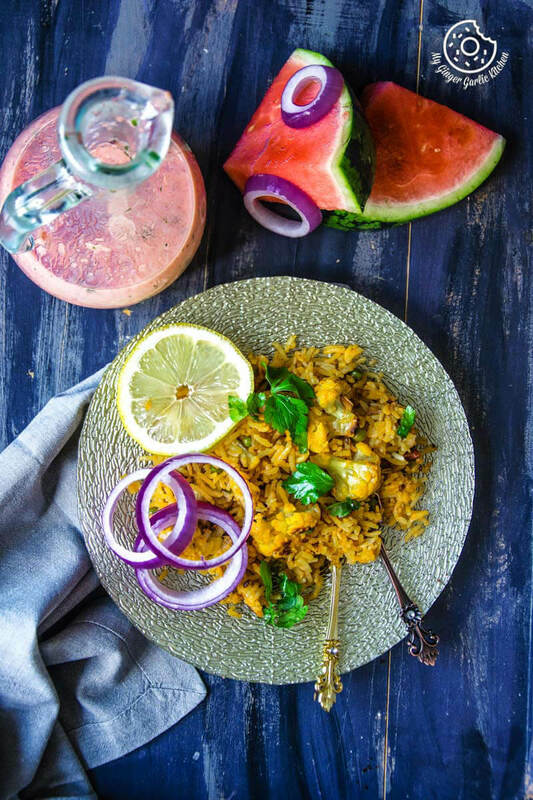 Learn to make Cauliflower Pilaf | Roasted Cauliflower Pilaf With Watermelon Sauce Recipe with a quick video tutorial — This Roasted Cauliflower Pilaf With Watermelon Sauce has the mouth-watering deliciousness of a comfort food at its best. You can enjoy it without any guilt. 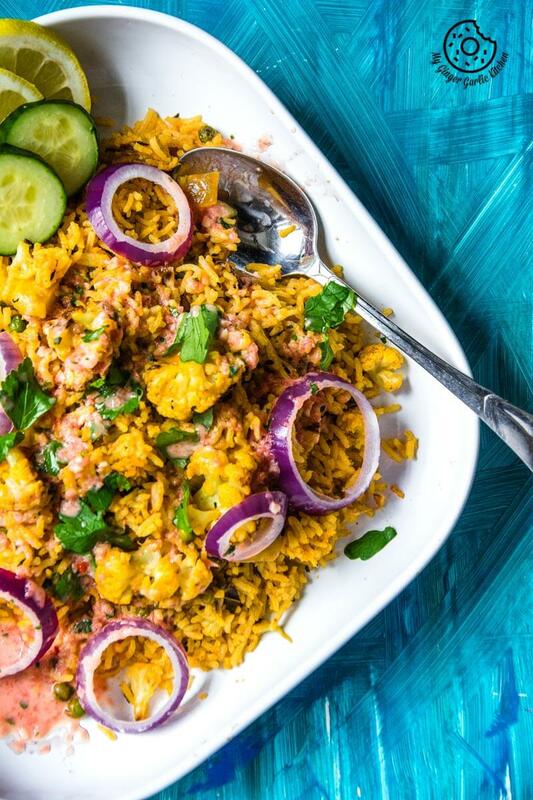 Plus, it’s a brilliant way to sneak vegetables into your family’s vegan and a gluten-free diet. A perfect meal for a cold day. Now that it’s actually cold outside, we’re craving for some comfort food to keep us warm during the coming cold times. 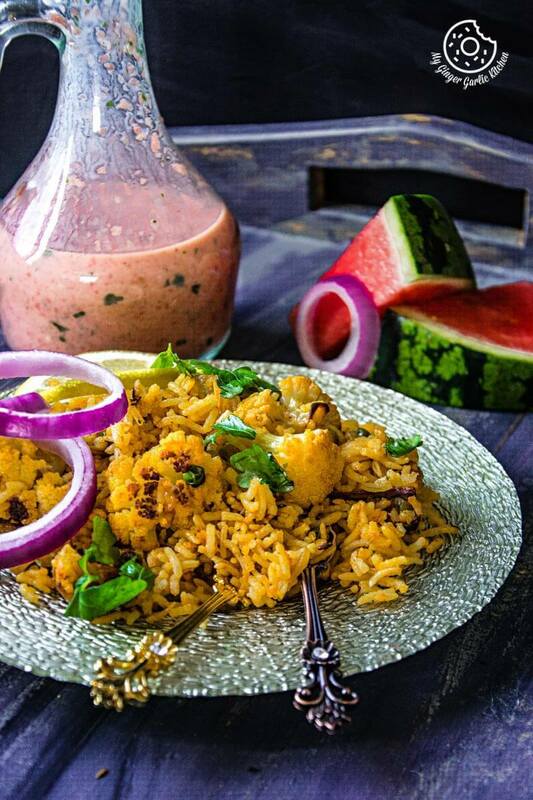 This Roasted Cauliflower Pilaf With Watermelon Sauce has the mouth-watering deliciousness of a comfort food at its best. You can enjoy it without any guilt. 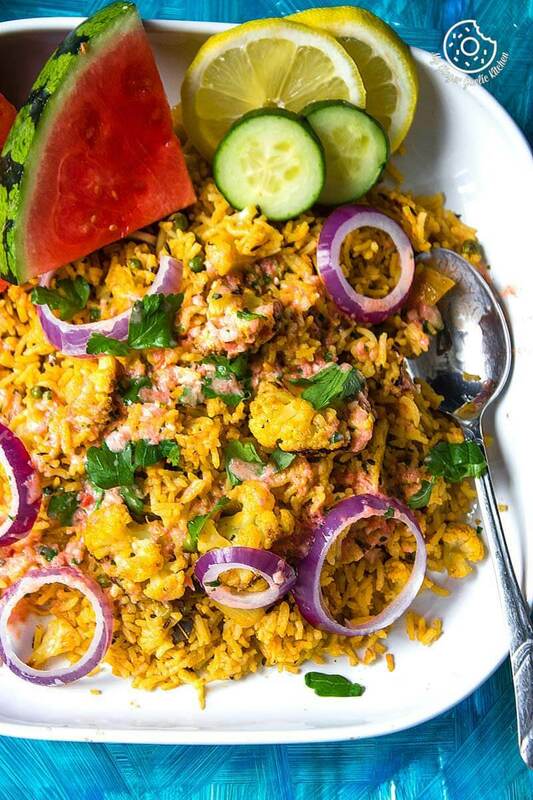 Plus, it’s a brilliant way to sneak vegetables into your family’s vegan and gluten-free diet. Isn’t it? Let me tell you a little incident on how this divine meal happened last week because of Adoria. For past couple of months, Adoria has been really inquisitive about the foodstuff. And she makes sure that she accompanies me every time I visit the grocery store. Well, that’s not it — the fun in the story has just begun. As I told you that my little one has been really inquisitive about food these days. She comes with me every time I go for grocery shopping. This usually happens thrice a week. Everything works great before we enter the grocery store. I try to focus on my grocery list and always hunting for something new showing potential in a foodie way. As I am contemplating all this, suddenly starts the what and why series. Well, this could happen for any vegetables, meat, bread, fruit, oil, sugar or any food or drink which you could think of. That’s because her question is the same and my answers are different every minute depending upon the thing she is asking about. All her ‘What’ sentences are really good, I love to answer all those ‘whats’. But the problem lies somewhere else. And here comes the less fun part — her ‘whys’. I don’t have any trouble in figuring out her why’s. But I just can’t do that in a grocery store, that too at a speed of 20 whys per minute. First, there are thousands of items. And I certainly cannot buy everything and then I have to come up with a new reasoning of why we are not taking those particular things. Because something I literally don’t have a logical reason not to take it. Second, the grocery store is a place where I like peace. No disturbances. Okay! Now, I will tell you how this happened because of Adoria. And she picked up a BIG one. Well, everyone craves for cauliflower in my family. So It was perfect. 🙂 Then we moved to the fruits section and there she saw a tiny watermelon. “Wow! Baby watermelon”, Adoria exclaimed. I got thrilled too after seeing that baby watermelon. It was not bigger than the size of a big tangerine. I have never seen a mini watermelon before. This time, I asked to her: “Should we buy this”? We bought those two jewels. She wanted me to cut that watermelon for her as soon as we reached home. So, I kept that in the freezer to cool down a bit and then we both relished that tiny watermelon. The joy of satisfaction on her face was so serene. She closed her eyes while she ate her watermelon to enjoy that moment. I also did the same — it’s amazing how we learn new things from kids every day. #Motherhoodjoy. Then in the evening, I made roasted cauliflower pilaf for dinner fulfilling Adoria’s demand. We ate almost 1 and a half watermelons. Kept the remaining half for later. Adoria and I ate our fair share and Daddy is not so fond of watermelon, so I decided to make a sauce with the remaining watermelon. I then paired that pretty pink sauce with the roasted cauliflower pilaf I made for dinner. This was one of the best-looking combos ever. 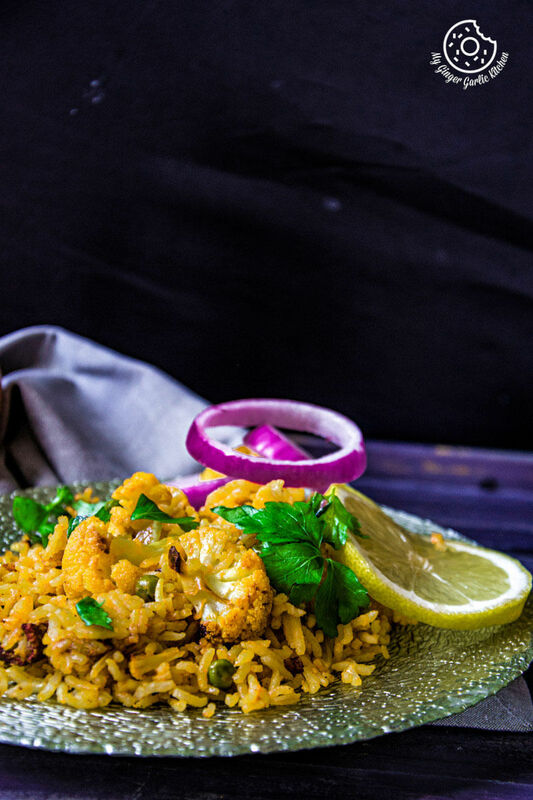 This roasted cauliflower pilaf is delicious when it’s served on its own. 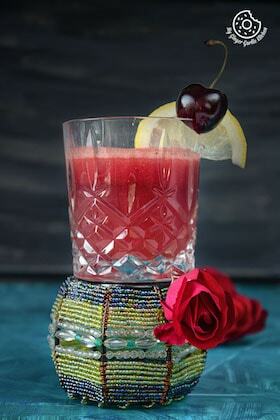 However, try this to pair with watermelon sauce to take this joy to next level. Delight in every single spoonful. The good thing about this sauce is that you can use it as a dressing for your favorite salad. It’s that good. 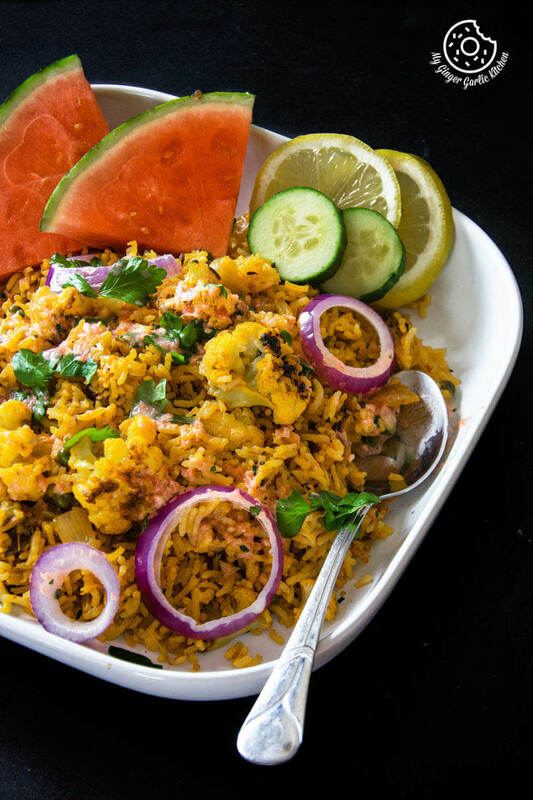 This healthy rice pilaf is flavored with aromatic spices. 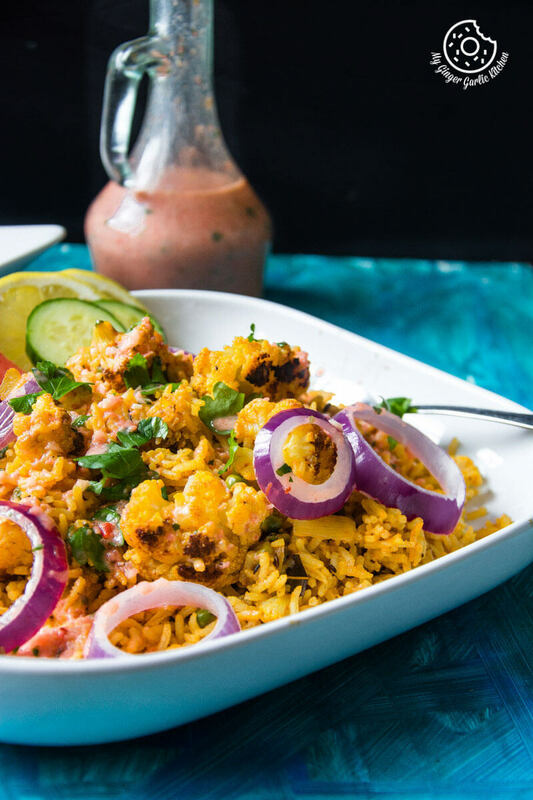 Once you have some cooked rice, this sturdy aromatic dish featuring roasted cauliflower and spices seasonings comes together so quickly. 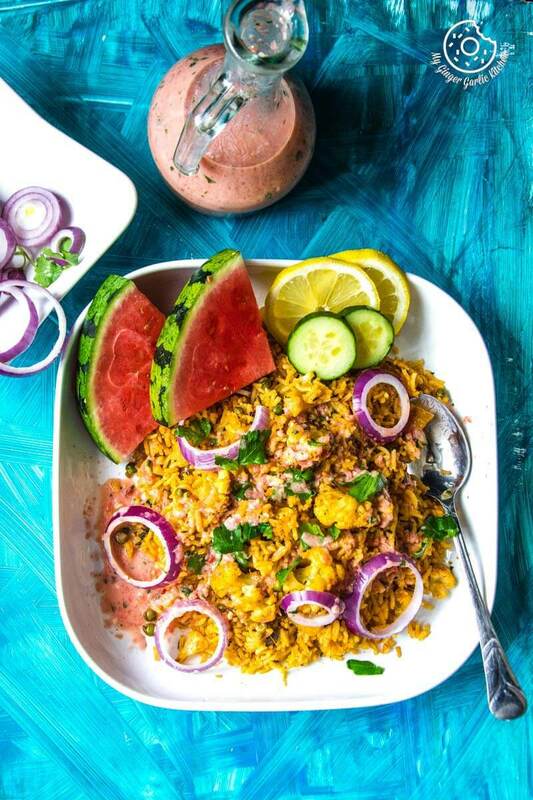 An easy, delicious and quick and gluten-free, a vegan meal is ready to be served. 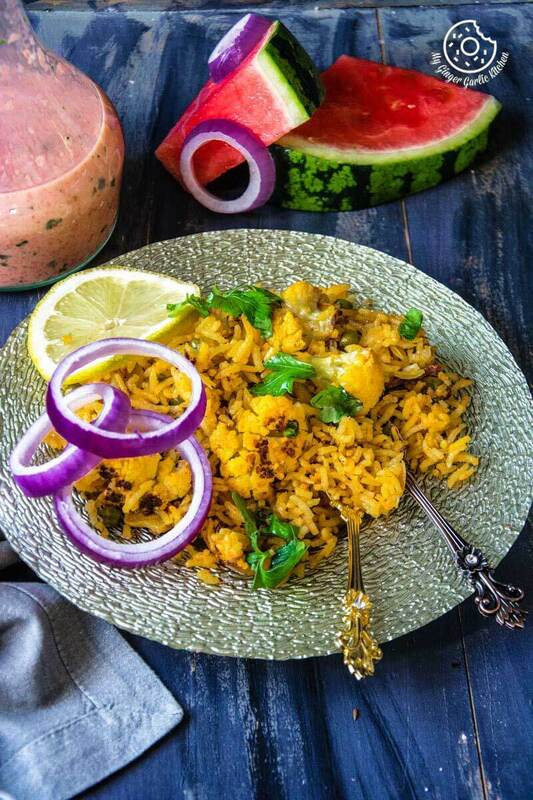 This Roasted Cauliflower Pilaf With Watermelon Sauce has the mouth-watering deliciousness of a comfort food at its best. You can enjoy it without any guilt. 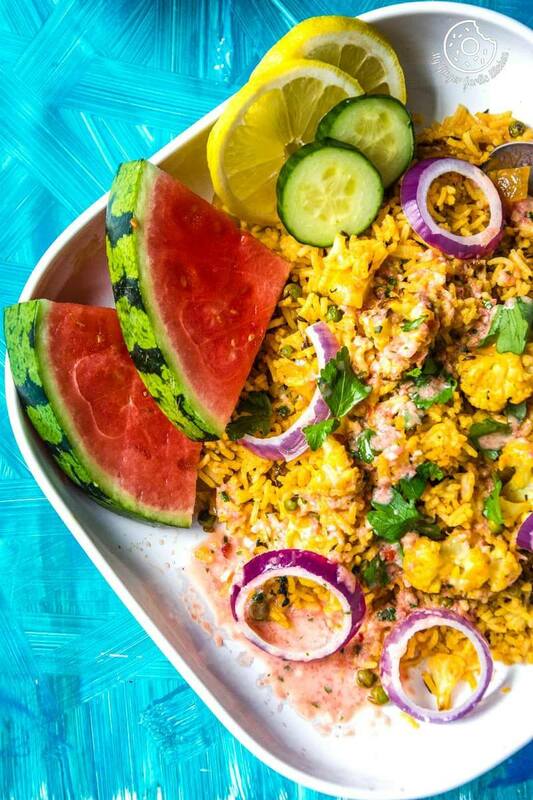 Plus, it’s a brilliant way to sneak vegetables into your family’s vegan and a gluten-free diet. 1. Heat oven to 200C/180C. 2. Toss cauliflower florets with garlic, salt, olive oil and toss well. 3. Arrange the florets in a single layer on a large lined baking tray. 4. Now add cilantro leaves and Roast for 25 minutes, or until the florets are deeply golden on the edges. 1. In blender or food processor, process parsley, watermelon, garlic, greek yogurt, chili sauce, salt, and pepper until liquefied. 2. Cover and store in the refrigerator. Shake well before using. 1. Heat 1 tbsp of the oil in a large pan, cumin seeds, and whole garam masala. 2. Saute for few 30 seconds and add ginger-garlic paste. 3. Sauté for a minute and add diced onions. 4. Cook for 5 mins until golden. Add green peas and cook for 2 more minutes. 5. Add tomato puree and cook for 3-4 mins. 6. Now add turmeric powder, garam masala powder, red chili powder, and salt. Mix well and cook for 2 minutes. 7. Add roasted cauliflower and stir gently. 8. Add cooked rice and mix well. Cook for 3 minutes on medium heat. 9. Gently stir occasionally. Remove from heat. 10. 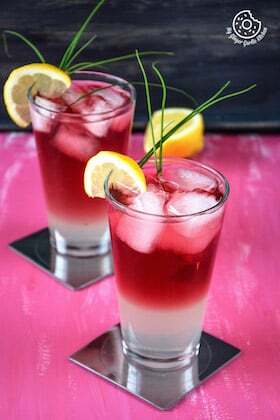 Serve along with Watermelon sauce.